Would you like your friends and family to receive the same quality care you got from us? Submit them as referrals! You can ensure that your patients receive the best care possible. Recommend them to Golden Dreams Home Care LLC. Golden Dreams Home Care LLC is now accepting senior care requests online. Please complete our form to proceed. Locally owned and operated, Golden Dreams serves the entire Quad Cities and surrounding communities. Offering a wide range of affordable and dependable home care services, Golden Dreams Homecare provides standard professional care to you or your loved one wherever you call home. 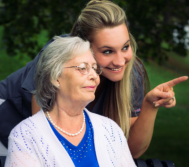 Senior Care Services are becoming a popular alternative to a nursing home, and Golden Dreams Home Care services are often used in conjunction with hospice and assisted living services. Each family’s needs are different and Golden Dreams Home Care is flexible and supportive in meeting those needs. By offering your loved one the quality one-on-one care they deserve, he or she can enjoy the comforts of home and remain independent for as long as possible! We are a company committed to providing exemplary care in accordance with performance standards. We take pride in maintaining our flawless reputation by providing our clients with the finest quality care as well as making them our number one priority.